Meter readings and energy-saving notes for dual fuel use at home in 2015. Self-consumption from PV was over 50% during the sunniest April in the UK on record; at the end of the year insulated the upstairs north wall with aerogel. 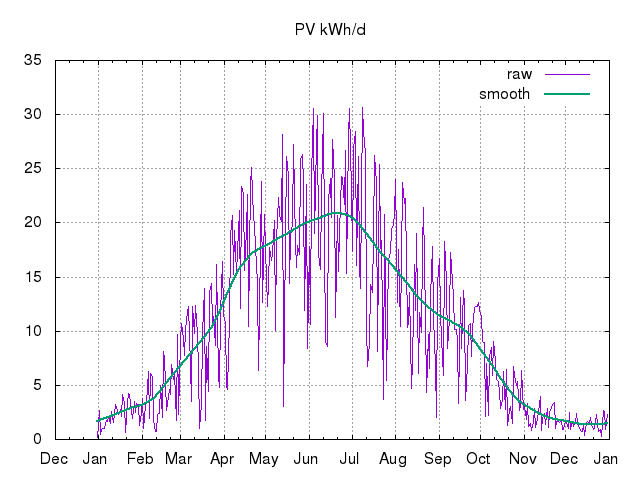 2015 data (kWh: e used 1786, e gen -3229, g 2862). See the daily PV generation logs for 2015 as .csv and .png chart. 2015/01 181 (5.8/d) -75 (-2.4/d) 606 (20/d) 20141231-19:25-GMT to 20150131-19:50-GMT (31d) Meter readings: electricity generation 74.6kWh, export 49.4kWh, import 155.8kWh (thus net consumption (I+G-E) 181.0kWh); gas ~54.6m^3 (so 606kWh @ 11.1kWh/m^3). Imports passed 6MWh right at the start of the month. HDD12=202 vs 156 last January (implying gas 2.5kWh/HDD12 at 3kWh/d baseload, or 2.7kWh/HDD12 at 1.7kWh/d baseload that iMeasure currently estimates though iMeasure claims a slope of ~1kWh/d from last year's data). 2015/02 155 (5.5/d) -115 (-4.1/d) 525 (19/d) 20150131-19:50-GMT to 20150228-19:12-GMT (28d) Meter readings: electricity generation 115.1kWh, export 85.0kWh, import 125.3kWh (thus net consumption (I+G-E) 155.4kWh); gas ~47.3m^3 (so 525kWh @ 11.1kWh/m^3). HDD12=199 vs 127 last February. 2015/03 161 (5.2/d) -294 (-9.5/d) 352 (11/d) 20150228-19:12-GMT to 20150331-17:40-GMT (31d) Meter readings: electricity generation 294.4kWh, export 242.1kWh, import 109.0kWh (thus net consumption (I+G-E) 161.3kWh); gas ~31.7m^3 (so 352kWh @ 11.1kWh/m^3). All OpenTRV local heating programmes cancelled by end of month (though heating nominally still on centrally in case of cold snap). HDD12=138 vs 112 last March. 2015/04 143 (4.5/d) -507 (-17/d) 132 (4.4/d) 20150331-17:40-GMT to 20150430-18:23-GMT (30d) Meter readings: electricity generation 506.7kWh, export 438.5kWh, import 65.8kWh (thus net consumption (I+G-E) 134.0kWh); gas ~11.9m^3 (so 132kWh @ 11.1kWh/m^3). Passed 17MWh exports. Note that self-consumption was over 50%. Sunniest April in the UK on record. HDD12=73 vs 44 last April and 121 the year before. 2015/05 148 (4.8/d) -583 (-19/d) 132 (4.3/d) 20150430-18:23-GMT to 20150561-18:20-GMT (31d) Meter readings: electricity generation 582.7kWh, export 502.5kWh, import 67.4kWh (thus net consumption (I+G-E) 147.6kWh); gas ~11.9m^3 (so 132kWh @ 11.1kWh/m^3). Passed 24MWh generation (19MWh on first meter, 5MWh on second). HDD12=30 vs 19 last May and 50 the year before. 2015/06 140 (4.7/d) -642 (-21/d) 112 (3.7/d) 20150561-18:20-GMT to 20150630-17:18-GMT (30d) Meter readings: electricity generation 642.2kWh, export 562.9kWh, import 60.7kWh (thus net consumption (I+G-E) 140.0kWh); gas ~10.1m^3 (so 112kWh @ 11.1kWh/m^3). HDD12=7 vs 2 last June and 8 the year before. 919 (5.1/d) -2216 (-12/d) 1860 (10/d) 20141231-19:25-GMT to 20150630-17:18-GMT (181d) Implies total footprint to date -205kgCO2: electricity (average 212W gross) -558kgCO2e @ 0.43kgCO2/kWh (netted), gas 353kgCO2e @ 0.19kgCO2/kWh. 2015/07 129 (4.2/d) -566 (-18/d) 98 (3.2/d) 20150630-17:18-GMT to 20150731-18:49-GMT (31d) Meter readings: electricity generation 566.8kWh, export 494.7kWh, import 56.6kWh (thus net consumption (I+G-E) 128.7kWh); gas ~8.8m^3 (so 98kWh @ 11.1kWh/m^3). Passed 20MWh generation on the first meter, >25MWh total. HDD12=1 vs 0 last July and 0 the year before. 2015/08 114 (3.6/d) -420 (-14/d) 85 (2.8/d) 20150731-18:49-GMT to 20150831-18:06-GMT (31d) Meter readings: electricity generation 419.6kWh, export 368.5kWh, import 62.8kWh (thus net consumption (I+G-E) 113.9kWh); gas ~7.7m^3 (so 85kWh @ 11.1kWh/m^3). HDD12=0 vs 5 last August and 0 the year before. 2015/09 147 (4.9/d) -340 (-11/d) 113 (3.8/d) 20150831-18:06-GMT to 20150930-16:41-GMT (30d) Meter readings: electricity generation 339.8kWh, export 282.7kWh, import 89.9kWh (thus net consumption (I+G-E) 147.0kWh); gas ~10.2m^3 (so 113kWh @ 11.1kWh/m^3). HDD12=14 vs 5 last September and 10 the year before. 2015/10 140 (4.5/d) -178 (-5.7/d) 123 (4.0/d) 20150930-16:41-GMT to 20151031-16:28-GMT (31d) Meter readings: electricity generation 177.8kWh, export 137.9kWh, import 100.5kWh (thus net consumption (I+G-E) 140.4kWh); gas ~11.1m^3 (so 123kWh @ 11.1kWh/m^3). Started work on IWI on north wall upstairs; family away for 1 week. HDD12=32 vs 15 last October and 23 the year before. 2015/11 168 (5.6/d) -62 (-2.1/d) 297 (9.9/d) 20151031-16:28-GMT to 20151130-17:12-GMT (30d) Meter readings: electricity generation 62.4kWh, export 37.0kWh, import 143.3kWh (thus net consumption (I+G-E) 168.7kWh); gas ~26.8m^3 (so 297kWh @ 11.1kWh/m^3). Heating on (in part) from 1st Nov. Continuing work on IWI on north wall upstairs. HDD12=63 vs 79 last November and 139 the year before. 2015/12 168 (5.4/d) -47 (-1.5/d) 285 (9.2/d) 20151130-17:12-GMT to 20151231-19:20-GMT (31d) Meter readings: electricity generation 46.5kWh, export 25.1kWh, import 146.1kWh (thus net consumption (I+G-E) 167.5kWh); gas ~25.7m^3 (so 285kWh @ 11.1kWh/m^3). Finished work on IWI on north wall upstairs. HDD12=38 (warmest December by far in these records) vs 183 last December and 152 the year before. 1786 (4.89/d) -3829 (-10.5/d) 2862 (7.84/d) 20141231-19:25-GMT to 20151231-19:20-GMT (365d) Gas consumption an all-time low of under 3MWh and beating last year, with a very warm December though slightly higher HDD12 (797) than last year (747) against a more typical 1218 for 2013. Not clear why electricity use up; possibly heavier use of dehumidifier in part. Note that grid electricity carbon intensity dropped significantly in 2015, which would reduce the benefit of our electricity exports, but previous (0.43kgCO2/kWh) figures will be used for comparison. 768kg (2.1/d) -1646kg (-4.5/d) 554kg (1.5/d) ~-0.32tCO2 (~-0.9kgCO2/d) gas/electricity emissions total for 4 people, based on 0.43kgCO2/kWh for electricity (netted) and 0.19kgCO2/kWh for gas, ie slightly carbon negative. First published 2015-01-01 , updated 2019-04-22 . Site copyright © 2007-2019 Damon Hart-Davis. Hosted by ExNet.